So, The Witcher isn't new, but the whole presentation focused on the improvements made to the game. After apologizing for already having given the presentation five times in a row, Tomasz Gop enthusiastically explained what the 'expanded edition' really expanded upon (and kept coming back to 'fan suggestions'). The expanded edition features over 5,000 lines of totally rewritten and rerecorded script, as well as a whole new German script created from scratch (was it that bad?). In addition to the script itself, a slew of new dialogue animations were added to make characters look less like wooden blocks and more like dynamic people. Monsters and NPCs are still based on the same character models, but have gotten randomly generated clothes and colors to shake things up a bit. Further, the inventory system has been improved and makes for easier storage and sorting; there is also an easier system for collecting loot after battles. Importantly, load times have been significantly reduced. Another nice feature is the ability to play with any combination of the available subtitles and voice tracks; we watched a scene with a Polish voiceover and Chinese subtitles. 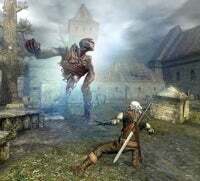 The boxed edition will feature two new adventures, the adventure editor, the official soundtrack CD, a CD of music inspired by The Witcher, a game guide, "The Witcher" short story by Polish writer Andrzej Sapkowski, a map of the Witcher world, and a 'making of' DVD. Already bought the game? Don't want to shell out again? Never fear — everything will be available for download if you purchased the original version. The enhanced version is expected out in September of this year. From one DS game on to another — I thankfully didn't have far to go to look at What's Cooking? with Jamie Oliver, and by this point was wondering exactly how these Atari people were remaining so chipper and upbeat. This is a reasonably detailed cooking simulator (unsurprisingly); I didn't spend too much time with the actual gameplay, but the guy demonstrating did allow me to try my hand after he scorched some prawns. It's ... a cooking game. A detailed cooking game with really complicated recipes. However, the 'special feature' that was apparently most exciting was the inclusion of lots of real Jamie Oliver recipes, the ability to create shopping lists based on those recipes, and using the DS as an ultra-portable cookbook/list maker. Now, I like to cook, but I'm not sure I'd pop my DS on the counter — sounds like a recipe for electronic disaster when DS meets boiling liquid or something. Still, the fact that the game comes with a book's worth of (actual) recipes is kind of cool. It will be out in December in time for a Christmas '08 release. Finally, I headed over to look at the second expansion for Neverwinter Nights 2, Storm of Zehir. The first feature noted was the expanded party editor, now featuring full party customization of up to four party members. There has also been several new classes added, though the only one mentioned in any depth was the "swashbuckler." The party conversation system was demonstrated, with answers and questions being based on intelligence, sills, class and so on. A new, detailed overland map has been added that is a walking map — no more zooming from place to place. The maps are completely moddable, and also feature traps and other surprises that players can interact with via skills. A mercantile aspect has been added, and trading and quests can help improve your merchant empire in the world — as well as make an impact elsewhere. New monsters will be popping up (the ones I saw looked very nice, even though the game hasn't been entirely 'cleaned up' yet and looked a bit dank in places). The message I was left with was "Lots of new stuff! New races, classes, feats, spells, enemies ... did I forget anything? Yeah, lots of new stuff!". The expansion is due out in the fourth quarter of 2008.